Puranas are filled with numerous stories regarding the origin of Lord Ganesha. The most widely accepted birth of Lord Ganesh is that he was created by Goddess Parvati. But there are also some Puranas that suggest that Ganesha is the Maanasika Putra (mind born) son of Lord Shiva. The reason for the different stories regarding the birth of Ganesha is explained in the Shiva Purana. It states that Ganesha originated in different ways in different Yugas (Hindu era) and each time there was a need for him to appear. Origin of Ganesha as the Mind Born Son of Lord Shiva happened when the Devas (celestial beings) approached Lord Shiva and asked for help to escape from Asuras (Demons). Shiva agreed to help them. And he meditated. Soon from his mind appeared a child with the head of an elephant holding a trident in one hand. This was Ganesha who immediately instilled confidence in all those present. Goddess Parvati took the child in her lap and said to the assembled that no human or divine endeavor will be successful without a prayer to Ganesha. 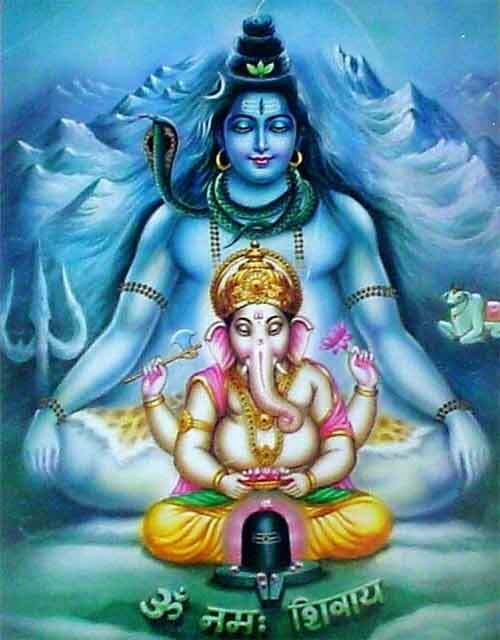 Shiva made Ganesha the leader of the Ganas (celestial army of Shiva) and was named Ganapati. There is a small deviation in some Puranas, which mainly tries to explain why Ganesha is worshipped or prayed at the beginning of all auspicious events. It is said that Goddess Parvathi was annoyed on seeing the Maanasa Putra (mind born) son of Shiva who was so amazing. She was annoyed because she played no part in his birth. Jealousy and anger overtook her and she willed that the head of this amazing boy be turned to that of elephant. And it happened as she willed. But the new elephant-head form of the mind born son of Shiva was even more amazing. Goddess Parvati repented and felt enormous love for the boy and she announced that Ganesha will be prayed to first and only then will other pujas take place. No prayer would succeed without the blessing of Ganapati. Why Ganesha is worshipped in the form of Om?